Designed and manufactured in the UK from lightweight but super tough plastic, muggi will catch all unwanted spillages, features non-slip rubber feet plus finger and thumb-holds - making it easy to carry for young or older hands. It is the only product of its type currently available in the world! • A easy to use cup carrier, particularly for older people or the disabled. 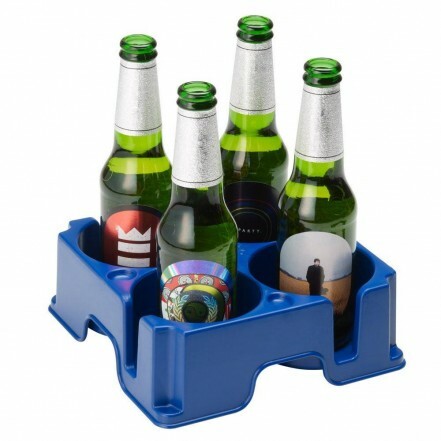 • A great looking and safe replacement for the office drinks tray! • Holds up to four mugs or cups of most sizes. • An ideal mug holder for your caravan, motorhome or camping drinks holder. • A perfect cup holder for your boat or yacht. The grippy rubber feet will keep your drinks in place. • muggi is made from tough and lightweight plastic and is guaranteed for life! • Stackable and simple to store. • Non-absorbent and easy to clean. • Thumb grips for one-handed drinks carrying.